For the first time, the International Space Station (ISS) will house a Chinese experiment. The research is to be on board the ISS next year. A Chinese experiment is being readied for launch toward the International Space Station (ISS) in what could be the forerunner of a larger space-cooperation agenda between the United States and China. NanoRacks, a Houston-based company that helps commercial companies make use of the space station, has signed a historic agreement with the Beijing Institute of Technology to fly Chinese DNA research to the orbiting outpost next year. No commercial Chinese payload has ever flown to the orbiting lab before. Over the past few years, the law has prohibited NASA and the White House Office of Science and Technology Policy (OSTP) from cooperating with China on space activities. That prohibition was originally signed into NASA-funding appropriations bills by Republican Congressman Frank Wolf (Virginia), who chaired the House Appropriations Commerce-Justice-Science subcommittee before retiring last year. The final law that Wolf put in place — P.L. 113-235, the Consolidated and Further Continuing Appropriations Act, 2015, which is in effect today — states that no funds may be spent by NASA or OSTP to "develop, design, plan, promulgate, implement or execute a bilateral policy, program, order or contract of any kind to participate, collaborate or coordinate bilaterally in any way with China or any Chinese-owned company unless such activities are specifically authorized by law after the date of enactment of this act." However, the new NanoRacks deal is a commercial arrangement, and experts consider it legal. Jeffrey Manber, NanoRacks' managing director, told Space.comthat he's delighted to be working with China on getting the nation's experiment on board the ISS. "We're excited to have a world-class organization that is contributing to our collective knowledge about what happens long term with the immune system during space travel," Manber said, adding that a recent visit to the Beijing Institute of Technology's School of Life Science left him extremely impressed. Manber said NanoRacks worked very hard to obey the rules of the Wolf amendment. "The White House has informed us that the agreement conforms to the Wolf amendment," Manber said. Chinese researchers are readying a payload to be taken to the International Space Station next year. The experiment is designed to determine if space radiation and microgravity cause gene mutation. Making use of a 7-lb. (3 kilograms) device to be housed on the ISS, the Chinese research seeks to determine if space radiation and microgravity cause mutations. The research will focus on mutations to genes encoding antibodies, parts of the immune system that identify foreign objects. The Beijing Institute of Technology's School of Life Science often publishes its results in Western scientific journals and interacts with the European research community and multiple U.S. universities. "This [ISS] project underwent a succession of prudent discussions and careful deliberations before we reached the agreement," said Deng Yulin, dean of the School of Life Science. "The results will answer some very important questions on life sciences," Deng said, according to an Aug. 8 story in China's state-run newspaper China Daily. "There has been no official cooperation in the space field between China and the U.S. for a long time, so I hope this project enables us to explore cooperation methods between the two space powers," Deng added. 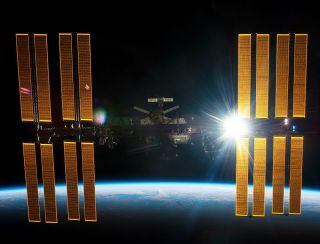 The NanoRacks contract, valued at $200,000, includes delivery of the Chinese experiment to the U.S. side of the ISS via a SpaceX Dragon cargo spacecraft. The experiment will then be placed within the Japanese Kibo module for a planned 15 days. Deng told China Daily that NanoRacks offered his institute "very favorable terms," including the payment schedule. The project is a commercial one that serves only scientific purposes, he added. "My university is an educational entity, and the project is a business activity, so I don't think it will violate the U.S. law," Deng said. The NanoRacks agreement with the Chinese spurred reactions from several space-policy experts, such as Joan Johnson-Freese, a professor of national security affairs at the Naval War College in Newport, Rhode Island. "Past U.S. policy of trying to isolate Chinese space activities, toward [the goal of] influencing, or pushing, China to change its policies — in areas from human rights to the development of anti-satellite capabilities — hasn't worked and in some cases has been overtly counterproductive to U.S. interests," Johnson-Freese said. As a result, Johnson-Freese told Space.com, "changing our approach in ways that do not involve technology transfer seems a rational action." It is in U.S. interests to better understand how China's decision-making process works, to have China act as a responsible player in space and to have a group within China advocate for nonaggressive policy toward the United States in space, Johnson-Freese said. "Given that the rest of the world is working with China in space, being the lone holdout has not worked in our favor in any of those areas," Johnson-Freese said. "Hopefully, this experiment on the ISS will be a positive step forward toward all of those goals." She noted that her views do not necessarily represent those of the Naval War College, the Department of the Navy or the Department of Defense. "I see this [China/NanoRacks agreement] as a commercial arrangement that has potential scientific benefits and [that] complies with existing laws and regulations," said Scott Pace, director of the Space Policy Institute at George Washington University in Washington, D.C.
"Whether it's a precedent for future activities remains to be seen," Pace told Space.com. Statements by U.S. politicians show that there may be an interesting "chess playing" factor in America's dealings with China. Secretary of State John Kerry shakes hands with Chinese Vice Premier Wang Yang at the conclusion of the U.S.-China Strategic and Economic Dialogue/Consultation on People-to-People Exchange at the U.S. Department of State in Washington, DC., on June 24, 2015. Some U.S. lawmakers have said they don't want the Russians to have a clear, open field with the Chinese. Better to have the U.S. engaged in working space deals with China, they say — but how best to evolve and work with China within the Wolf amendment? As for future U.S.-China space relations, the first "U.S.-China Civil Space Cooperation Dialogue" is slated to take place in China before the end of October. Last June, the United States and China decided to establish regular bilateral, government-to-government consultations on civil space cooperation. That agreement came out of the seventh round of the U.S.-China Strategic and Economic Dialogue, held June 22-24 in Washington, D.C, with Secretary of State John Kerry taking active part in the discussions. The two sides held in-depth talks on major bilateral, regional and global issues. More than 70 important outcomes resulted from the dialogue, including a number of space items. Aside from putting in place a "Civil Space Cooperation Dialogue," the two sides also decided to have exchanges on other space matters, including satellite-collision avoidance, weather monitoring and climate research. The agreement signed by Kerry reflects State Department activities with China, which are not prohibited by law.